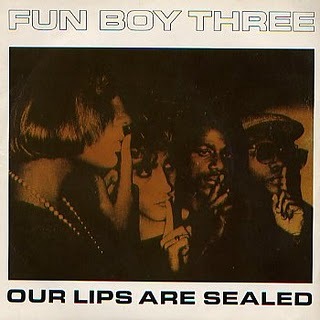 Remembering Fun Boy Three's "Our Lips Are Sealed"
It's hard to believe that it was 35 years ago this month (March of 1982), that the Fun Boy Three, comprised of three ex-members of The Specials (Terry Hall, Lynval Golding and Neville Staple), released their first self-titled album. It's fair to say that the album had a huge impact on me as a music fan and a musician. The Fun Boy Three succeeded in taking me out of my comfort zone and also opened my mind to the ways that music could be fun, subversive and serious all at the same time. While "The Lunatics Have Taken Over The Asylum" had a strong Specials influence -- it was the uniquely strange and hypnotic "Way On Down" along with "Alibi" and the insanely catchy "The Telephone Always Ring" (which explores Hall's agoraphobia) that helped me to appreciate the darkly weird world view and talents of Terry Hall. As a teen in the early 80's, I was drawn to the colorful haircuts and pop stylings of these songs (their partnership with Bananarama certainly didn't hurt! ), but it was hard to grasp the level of sarcasm and black humor that he brought to these songs. As an adult, I love and relate to them even more. The first album quickly established Fun Boy Three as pop stars and household names across the U.K. They quickly followed-up their first with 'Waiting' released in January 1983, which in my humble opinion may be one of the best albums released in the 80's. Produced by David Byrne of the Talking Heads, it was a beautifully produced and sleek-sounding collection, filled with tales of life's trials and tribulations, covering subjects from child-abuse and drug smuggling to racism, divorce and infidelity. That said, I'm taking a closer look at the story behind of the most popular songs from the album -- 'Our Lips Are Sealed' -- which was named one of the 100 Greatest Pop Songs of all time by Rolling Stone in 2000. "Like I said, he had a girlfriend in England, and they were talking about getting married and all this stuff. So I don't know how I got in the picture. And, you know, that's something that I did as a teenager, maybe I was 20. That's something I would never do now, knowingly enter into a relationship with someone who was with someone else. I mean, it was completely screwed on my part. Although I think when people do that, you really have to look at the person who's in the relationship, and they have to take the burden of the responsibility as well. Anyways, it was one of those things with the tragic letters, "I just can't do this." You know, "I'm betrothed to another." All that kind of stuff. And I think he ended up marrying that woman, and having kids, and of course now they're divorced, so… ." The Fun Boy Three also recorded an Urdu version of the song (yes Urdu, one of the main languages of Pakistan). There are two possible stories behind the recording of this rare b-side version. The first is that Ingrid Schroeder, a member of the Fun Boy Three backing band, read and recorded phonetic Urdu lyrics (which seems plausible given the rather flat sound of the vocal delivery). The other story (which I prefer!) is that the band brought an older Pakistani woman into the studio and had her translate and then record the lyrics. The band may have been prompted to record the Urdu version by the album's producer David Byrne, who had recently recorded 'My Life In The Bush Of Ghosts' with Brian Eno which featured a lot of 'found' voices mixed with danceable beats. Have a listen below. 'Our Lips Are Sealed' continues to have legs nearly 30 years later. The song was re-worked by Nouvelle Vague and Terry Hall in 2009. The video features an old Louise Brooks movie. 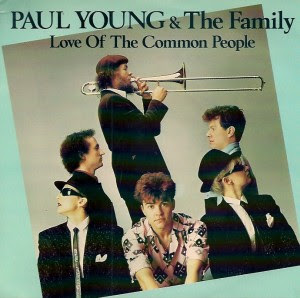 The first time I heard 'Love Of The Common People' as sung by 80's blue-eyed soul singer Paul Young, I was struck by the lyrics to the song. In contrast to much of the other cheery new wave that dominated the airwaves at the time, the lyrics tell a bleak story of poverty and joblessness. There is a mention of 'free food tickets,' a reference to government food stamp and welfare programs, and the mention of clothes and shoes with holes that is offset by family love and the power of dreams. 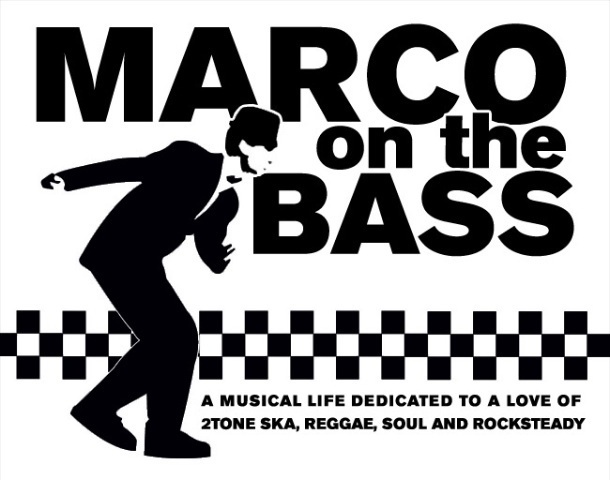 Only later did I learn about the songs reggae and 2-Tone connections -- Young's version was based on a cover of a reggae version of the song popular in the U.K. in the 70's and the searing trombone solo in the middle eight of Young's version is played by the one and only Rico Rodrigues of The Specials! "Love Of The Common People" has an amazing history and is the rare song that has been performed and covered in a verity of musical genres including punk, reggae and 80's pop. The song was written as a Woody Guthrie-like folk ballad by John Hurley and Ronnie Wilkins in the late 60's. Though Hurley and Wilkins did not expressly convey it the lyrics, the song is a protest of what they saw as the failure of the American government to do more for the poor and unemployed than it already had. As we endure the first few months of the Trump Administration, I could not think of a more appropriate song to write about, as a Republican dominated Congress seeks to cut and limit more and more of the safety net of the Affordable Healthcare Act, unemployment insurance, and other benefits that the millions of Americans have used to support themselves. The song was first released in January 1967 in the U.S. by The Four Preps but gained prominence when it was recorded by Country singer Waylon Jennings. However, the most powerful versions of the song are the soul and reggae takes. The first was recorded by Washington, D.C soul/funk band The Winstons in 1969. However the definitive version --in my humble opinion -- was recorded by reggae vocalist Nicky Thomas in 1970, reaching number 9 in the UK Singles Chart. It was Thomas's only major hit single, and became his signature song, coming to define the term 'pop reggae'. The story of how Paul Young came to record the song is very interesting. Young met Jake Burns of Irish punk band Stiff Little Fingers at one of their concerts. The band had added the song to their live set and Young asked Burns whether Stiff Little Fingers were planning to release the song as a single. When Burns told them they weren't, Young asked if they minded him releasing it as a single. They said he could, not thinking the single would do well. Burns later self-mockingly stated in an interview, 'Pfft! Go ahead. You'll never get anywhere with that, mate. Yeah, number 2, that'll teach me!'. The Stiff Little Finger's version has a great punky reggae feel. Young initially released his interpretation of 'Love of the Common People as a single in 1982, but it failed to chart. It was only when Young had his first hit in 1983 with 'Wherever I Lay My Hat (That's My Home)' that his record company decided to release the song again. The single peaked at #2 in the UK, and reached the number one spot in Ireland and the Netherlands. The song features a wonderful trombone solo in the middle which was provided courtesy of the one and only Rico Rodriguez. The trombonist had just endured the break-up of The Specials and decided to branch out and was tapped by Young to join his band. Rodriguez mentioned the song in an interview. Q: And it was time to escape the English raining to some sunshine for a change. A: Yes, and before me go to Jamaica me do one recording with Paul Young, a song from Nicky Thomas, 'Love Of The Common People', and I think Paul Young made a hit out of it. A: Yes, and I did the solo in that. And when I was in Jamaica I used to hear it on the radio in Jamaica, but since I'm in Jamaica here nobody don't even know is me who do the solo on that record. But it got regular play, it was regularly played on the radio. Look for Rodrigues in the video of the song below.